How does one read a book inspired by an ancient collection of Chinese Zen poems, The Book of Equanimity? At least in traditional Chinese poetry the allusions could be recognised by educated readers, while the Equanimity Verses themselves have generated centuries of commentary. In the case of Richard von Sturmer’s own verses there are unusual and multiple challenges – the form, an expanded version of the Japanese five-line tanka; the relationship of the themes to Zen koans; and the presence behind the stanzas of the original Equanimity Verses, together with their associated interpretations. The 100 verses in Richard von Sturmer’s collection can be like koans themselves, subtle and indirect enough to break down one’s expectations. The reader, unless a Zen adept, has to approach them naively, as poems. There is no teacher present to nudge one towards understanding. The pillar and the lattice windows. by a blind person in a dream. carry you across the evening sky. This is the style: simple, declarative, often built around a short narrative. The tight form requires that the images work. There are no second chances, but they are not needed. The verses repeatedly introduce startling and vivid metaphors. An example is the poem which starts with a ‘dream before grandparents’. Like the Aboriginal dream time, it evokes ‘a forest of elders / under overcast skies’, but shifts abruptly into the here and now with ‘… women in dresses / the colour of hydrangeas / and candle flames’. The poems, like their Chinese forebears, also have an easy relationship with the natural world. There is no reaching for similes from nature to express frustrated emotions, or the yearning to be part of the whole that is part of the Western romantic tradition. This is a world of mutability and uncertainty, with perplexing distances between where one might be and larger scenes. A nameless functionary in one verse, like a Chinese poet in a remote post, knows that, ‘No doubt orders will follow. / Already the crimson seal / leaves a crimson imprint.’ He recognises his insignificance, even the risks to his life, just as in other verses famous historical figures such as Rosa Parks and Mishima take their place in the never-ending number of human arrivals and departures. The Equanimity Verses extend Richard Von Sturmer’s familiar approach, seen, for example, in his earlier collection of poems and prose poems, A Network of Dissolving Threads. It involves a concentration on particular moments of experience, often numinous. The influence of the Chinese originals and the verse form seem to have made this present collection less intimate and more condensed, but it loses nothing for that. Those who are familiar with the koans in the original Book of Equanimity will appreciate the sometimes brash mingling of allusion and modernity, as in the disturbance of a life pf five hundred years as a fox by the arrival of bulldozers, followed by the image of a ‘russet harvest moon’. But this knowledge is not needed to read the verses. Only occasionally are there mystifying references, such as one to a miller’s daughter in the penultimate verse, or to Zen figures such as Old Luzu. These strange and beautiful musings stand on their own, enriched by the knowledge and wisdom upon which they have drawn. 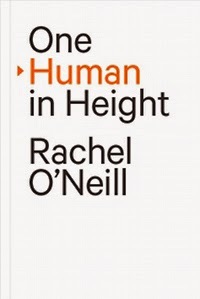 Rachel O’Neill’s collection of prose poems, One Human in Height, also move dizzingly from one subject to another and with equal skill. This is her first collection of poems. It is one of the works published by Hue & Cry Press, an offshoot of the new Auckland-based literary/art journal Hue and Cry. O’Neill was a graduate in 2008 of the MA course in creative writing at Victoria University. It is refreshing that a collection of poems as good as this has come from a new publisher, rather than Victoria University Press. The latter has often seemed to be an exclusive outlet for writers from the Wellington programme. Though established only in 2012, Hue and Cry already has an impressive list of contributors. This start suggests that there will be plenty of other significant work coming from its associated press. Rachel O’Neill is one of those writers fortunate enough to be able to illustrate her own work, and her drawings, enigmatic, deliberately low-key on lined paper, almost crazily irrelevant, extend the sense that the poems can end up anywhere. She has also designed the book cover for the poems of Alison Glenny, another Hue & Cry production. I sat for a while on the dry stones, then headed home along the beach. The sea’s pale back was turned to me and curved up onto the sand. All around, the echo of skin on skin, the lapping and ending of it. Turning, I saw a man drag a regular garden barrow from the sea. He shunted past me muttering, ‘My father’s memories’, as if every year he bore them on that stretcher down to the water. Another piece, ‘The Kafka Divers,’ references the peril (I assume!) of immersion in the nightmarish world of a writer such as Franz Kafka. O’Neill’s own prose poems are technically very similar to those of Kafka, without the horror and lack of control that Kafka’s characters experience. Like Kafka, she can abruptly shift perspective after what seems a commonplace beginning. The intimacy of a hand slipping under someone’s coat can set off reflections on Ovid, wanderings through various thoughts and exotic geographies and finish in a room ‘… flush with violet folds of velvet and passionfruit vines’ (‘Inside your Coat’). The warmth in the poems about her family is protected from sentimentality by this versatility and a sense of what is concealed behind appearances. What seems a slight recollection can suggest potential life directions – a moment pedalling along the centre line in a road while thinking of an encounter at a party, or what her father writes in his secret diary about the impact of the war. ‘I came into the world with nothing bar a capacity for waking in unexpected places,’ starts one poem. The poems, too, deliver much that is unexpected and this is part of the pleasure one gets from reading them. JOHN HORROCKS is a poet and writer, and a research associate in the School of Health and Social Services at the Wellington Institute of Technology.